Billy grew up in northeast Arkansas, just over a hundred miles from Memphis. It was there that he came to love Memphis-style BBQ, with its flavorful dry rubs, crusty but tender hickory smoked ribs and pulled pork, and tangy tomato-based sauces (served on the side). A few years after enlisting in 1991, the Navy sent Billy to college in Memphis, giving him four years actually living in the city to further solidify his love affair with its BBQ. For as much as he liked to eat BBQ, it wasn’t until he was stationed in Washington state in 2000 that he bought his first smoker and cut his teeth alder smoking salmon. It wasn’t long though until he started experimenting with ribs, pork shoulders, and beef brisket. It was during his next tour teaching at the University of Missouri that Billy kicked his BBQ into high gear and became a legitimate pitmaster. 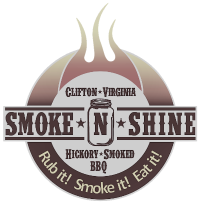 Not only did he transition to cooking on wood-burning offset pits during this time, but he started designing and building his own pits, including the large trailer-mounted smoker Smoke-N-Shine still uses today. He honed his skills and refined his recipes while cooking on these pits for Mizzou football tailgate parties and numerous catering gigs for his church, colleagues, and friends. Over a decade and several Navy moves later, Billy still enjoys cooking for the masses while continuing to perfect his craft. While his ribs and pulled pork have remained very much in the Memphis tradition over the years, he is a huge fan of Texas-style brisket and is more proud of his ability to master it than anything else. Mac is a self taught BBQ Pitmaster taking a few decades to hone his skills enough to be a true Pitmaster. Mac is passionate about the science of the smoke ring and chasing that perfect taste and tenderness everyone has come to love in BBQ. In his youth Mac worked for his family’s BBQ business in North Carolina developing his culinary instincts in Eastern North Carolina chopped BBQ and whole hog catering. After becoming a sailor in the United States Navy he trained his culinary palate at Johnson and Wales University with a concentration in butchery, stocks and sauces. While in the Navy he has traveled the world learning new techniques from locals on 5 continents. During his travels he found his favorite BBQ Style and is none other than that of Central Texas. He has developed a passion for pit technology striving to make the perfect bark on every brisket.